Emily Annie Theophila Bayley, her Father’s Gift. Compiled in 1844 by Sir Thomas Theophilus Metcalfe 4th Bart. 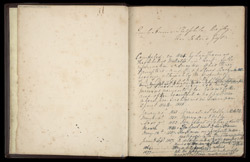 for the information and education of his three daughters – and this valued book in 1851 became ultimately the property of E.A.T. Bayley as being the eldest Daughter being brought out to her in India by her sister…?? It is treasured by her, as a most precious memento of her beloved father and of her beautiful and happy home where her first years in India were spent 1848-1853. Janry 20th 1848 Arrived at Delhi. EATB. Novr. 3rd 1853 Her beloved Father’s death. March 1854 The last visit to her home. 1864 House only partially restored.